Trust Us with your shipping needs. We Pack * You Pack * We Ship - USPS, UPS and Fedex. Let us take the hassle and worry out of your Christmas Shipping. 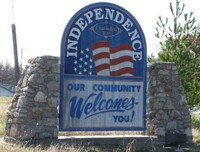 Once called "Haytown�, Independence is located in the Southeast corner of Kansas. It was settled in 1869 by a band of men from Oswego, Kansas who wanted to become founders of a city. The 137 year old history of this town contains pioneer stories (Little House on the Prairie), oil magnate (Harry Sinclair), stately mansions, the first lighted baseball stadium, the first monkey to go into space (Ms. Able), a presidential candidate (Alf Landon), a Broadway playwright (William Inge), a movie star (Vivian Vance), and Neewollah, just to name a few. Come see us! Many businesses and organizations have already been listed on this website but no information about them has been included. Others have been missed and need to be added. If you currently have a listing and would like to edit it or have no listing and would like one added please Click Here for additional information.